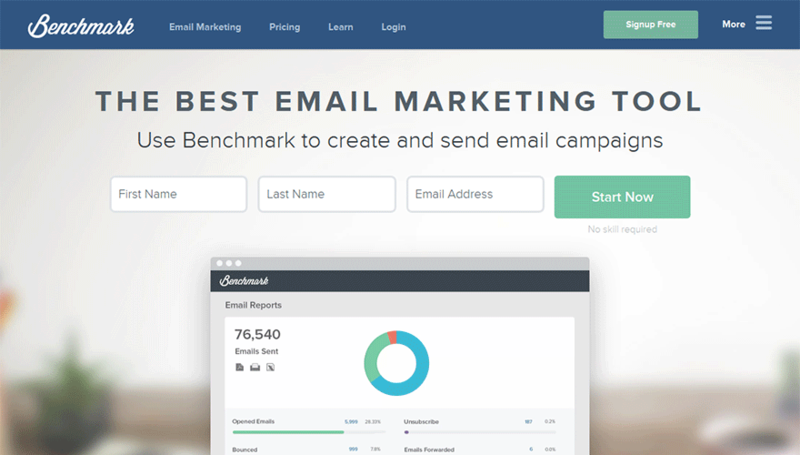 Benchmark Email was founded in 2004 and have established themselves as a quality email marketing provider to compete with other recognizable brands. One of the best features of Benchmark is the fact that you can use them for free for up to 2,000 contacts. The signup for says that they offer “free email marketing services for life” along with the 2,000 limit. There’s confusion about this plan which we cover below. Benchmark Email provides many features you’d expect from a service provider including easy-import of your email contacts, opt-in forms, email management tools and tracking tools. They also include advanced features that Internet Marketers will love including split testing, an inbox checker to check your email against various email clients and beautiful mobile-response templates that catch the eye. Offers 400+ high-quality mobile-ready email templates with features including split-testing that advanced marketers will enjoy. We were left confused about actual pricing and what their free account comes with. Additionally, live chat didn’t respond during our review. Advanced Analytics provided by Google Analytics. When we tried to do a mock signup, we saw the following messaging implying a free account is available for life with a maximum of 2,000 contacts which is an awesome deal. However, when we visit the pricing pages and documentation, we can’t find any other reference of this free offer. Viewing all of this through the potential customer’s eyes, this is all very confusing and will require a customer support contact to get a full understanding since their website is not clear. Why do they advertise free for 2,000 contacts but then limit your list size to 600 contacts for $11.95? As you can see, assuming you need to pay to use their services, you have the choice on how you’d like to pay. Send Based – These plans allow you to send X amount of emails with no limit to the size of your mailing list. Of course, the limit is inherently there because if you wanted to send a single email to 600 clients, you’d only be able to send one email blast per month. Not exactly the plan I’d recommend. List Based – This is the format most email service providers offer. You can have X amount of contacts and send an unlimited amount of emails to those clients. From a marketing perspective, keeping constant contact with your list is crucial, so typically I’d recommend this pricing type. One of the features that caught our eye first was the split testing features they provide. With Benchmark, you’ll be able to A/B split test subject lines, from names, set test groups, use variables and even test 2-3 variants at a time. This feature alone will allow you to boost your CTR (click through rate) which ultimately will help you improve sales (more traffic to your offer). Inbox Checker – This is a great idea for a feature because it allows you to see how your email will look in various devices, browsers and inbox clients. This means you’ll be able to see how your email will look in Yahoo, Outlook, iPhone, iPad, Gmail and many more. Newsletter Templates – A quick review of their templates shows you’ll be ready for any occasion! Whether you need to send out a promotion, holiday event, press release, social media engagement or anything else you can think of, they likely have you covered. Be sure to go to their template page to see all that is available. List Management – They offer management options that is sure to please including email segmenting by demographics, likes, dislikes and more. They offer you the ability to import your contacts in .xls, .csv and .txt. You can even import your contacts from Salesforce, Gmail or Yahoo as well. Social Media Integration – With Benchmark, you’ll be able to integrate with Salesforce, Facebook signup form apps, WordPress and Magento plugins and many more options. We tried the customer support live chat early morning and we waited for over 2 minutes with no response received to get help during this review. We wanted to ask them about their free service and what the differences are between the 2,000 contact free account versus their 600 contact $11.95/mo plan. That being said, we were impressed with the amount of documentation and customer help you can get with Benchmark. They currently offer email marketing manuals, video tutorials, webinars, articles, terminology assistance, newsletter archives and more. As for contacting their support department, they list a toll-free telephone number on their website and offer a customer support email form to get help as well. At the time of this review, telephone hours were not listed so verify they will be available when you need them.